Around 400 people gathered in L.A.'s historic Little Tokyo district Friday evening (28th), for a candlelight vigil against hate crimes. To commemorate the unconstitutional internment of 120,000 Japanese Americans during World War 2, members of the Japanese American community held a candlelight vigil to warn against hate crimes committed against Arab Americans and their possible internment in the event of a full scale war. 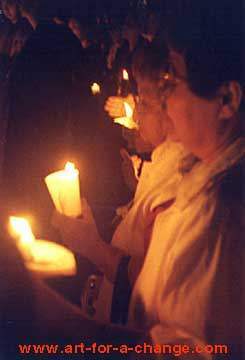 In this photograph, dozens of Japanese Americans solemnly hold their candles during a moment of silence for all those who were killed in the appalling terrorist attacks of Sept. 11th.